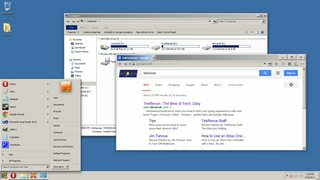 Bakuchris wrote: I got vistart running on my computer, but when I click on the button nothing happens when I run the vista explorer on Windows 10. Also the button keeps going on weird places on the start menu. Oh...never head of that one .-. Also I just realized that we never tried running Classic Shell 3.6.8's ClassicStartMenu.exe in Windows Vista compatibility mode .__. Bakuchris wrote: Augh, my copy of Windows 10 broke when I uninstalled the classic theme, first time this happened to me. I will need to reinstall it again. Sorry for the double post...does anyone remember this concept image? windows.nt.win32 wrote: Can't you just add an exclusion in the Windows Defender settings? I remember being able to disable or uninstall Windows updates including Windows defender I think in Windows 7. I'm not sure how it is in Windows 8/10 though. Edit: Apparently gpedit.msc can allow you to do this. Home editions don't have group policy, but you can enable it too. There's also a registry file you can use to disable windows defender for Windows 10 as well. For Windows 8, you can do it within the control panel. For both OS's installing another antivirus can disable Windows defender too. Splitwirez wrote: It's dangerous to go alone! Take this. I'll look into that .-. Splitwirez wrote: I'll look into that .-. One can load the taskbar in themed mode and then disable themes by running w8classic or using handle utility. The taskbar will remain themed while everything elese will not. Anixx wrote: One can load the taskbar in themed mode and then disable themes by running w8classic or using handle utility. The taskbar will remain themed while everything elese will not. Yeah, but the Classic Tenbar utility still doesn't work properly unless themes are enabled. When using the classic theme, it just seems to create a bar above the actual taskbar (at least that's how I've experienced it). One can wait for Classic AE to be ported to W10. windows.nt.win32, can I get a screenshot of that? and then switch classic theme on for other applications. Still if the taskbar theming is on (with Classic AE or another theme), there will be no subpixel hinting of the taskbar fonts. 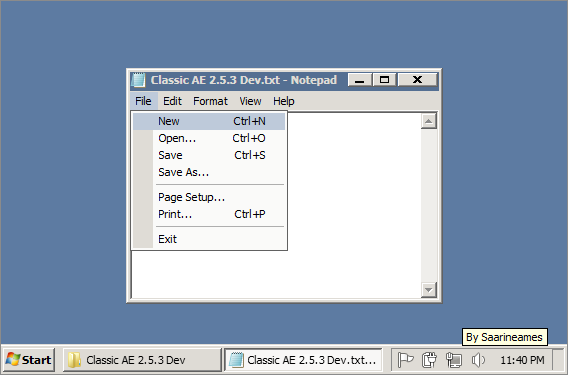 Anyway, Classic AE is not yet available for Windows 10. Umm...I guess you missed the announcement? About how Windows 10's taskbar is can't be modified via Visual Styles? That's the whole reason it doesn't retain its prior Classic theme compliance ._. How do they theme it then? ...Well, this is seemingly only for pre-release build. Anixx wrote: How do they theme it then? Whats sad is that you cannot run the old versions of Windows 10 beta without changing your date as they have a certificate in each build and know when they have expired. P.S. when I run the Vista explorer I get the old balloons in the system tray compared to Windows 10's big boxes that tell you things. Bakuchris wrote: Whats sad is that you cannot run the old versions of Windows 10 beta without changing your date as they have a certificate in each build and know when they have expired. It is called time bomb and can be removed, but what's the point of running W10beta? I see no purpose at all. P.S. Sorry, this may be useless info if the expiration is based on certificates. Some anti-piracy tools can fix that... ._. Bakuchris wrote: P.S. when I run the Vista explorer I get the old balloons in the system tray compared to Windows 10's big boxes that tell you things. Splitwirez wrote: Sorry for the double post...does anyone remember this concept image? Bakuchris wrote: Even without a start menu and desktop, Windows 10 sure looks good with the classic theme. How on earth did you get taskbar working on 10? Looks like a good blend of a modern and classic UI. It would be perfect for those who would like to use the classic theme, but still want a Windows 8-esque interface. Cool, can't wait to see how that turns out. So anyway, is there any information on porting Vista's explorer.exe to Windows 10? I'm still not sure about using an older version of explorer, but maybe it could work. At the very least, it would be a good temporary solution. That's kinda what I was thinking. Also why is the classic theme's maximize/restore button one pixel too far to the right? ._. windows.nt.win32 wrote: So anyway, is there any information on porting Vista's explorer.exe to Windows 10? I'm still not sure about using an older version of explorer, but maybe it could work. At the very least, it would be a good temporary solution. Vista's Explorer does the taskbar perfectly fine. Tray works too. Start Menu is kill, though, as is the right-click menu (sort of?). That... looks awesome. I love it! So if this many people are having issues with classictheme.exe, we should really start looking into what's going wrong. I mean now we've got a report of BSODs? Wow. This is my first post here and I am happy to join this community! POLL: Classic Shell... Whos using it? T60p - Windows 10 or Windows 7? I have a T60p that needs to be rebuilt. Will W10 build on it? Or must I use W7? Any other advice, like where to get drivers?